Why Did This Pulitzer Prize-Winning Journalist Ditch His NBC Gig for a Pot Pub? Not so long ago, the idea of a marijuana news site would have probably conjured up images of smoking paraphernalia and stoner jokes. But as marijuana legalization has become an increasingly important political and social topic, it’s also begun to attract more serious media attention. For further proof, see Al Olson, the Pulitzer Prize-winning journalist and MSNBC.com founding editor, who recently left his post at NBC News to join Marijuana.com as managing editor. We spoke to Olson, one week into his new job, about how he plans to change the face of cannabis coverage. 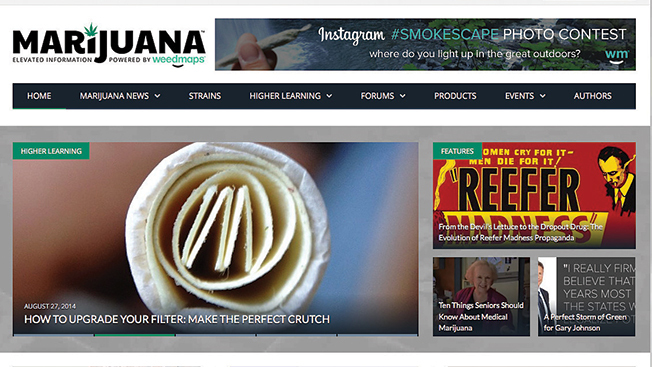 Why leave your longtime job at a well-respected media organization to join Marijuana.com? For the last three and a half years, I’ve done a deep dive into this industry, trying to understand the players, the lay of the land, and I found it fascinating. It’s also one of the most underreported stories that I’ve seen in some time, and I think that there’s a lot of stigma and a lot of misunderstanding about the industry. I felt that the best way for me as a journalist to tell this story was to really immerse myself in it, and this was an opportunity to do that. How hard is it to cover an industry that’s still illegal in so many places? Early on, I found the biggest problem I had as a journalist was access. Now that it’s legal in two states, and more states are looking at that as a possibility, it’s a little bit easier to cover. But I think there is reluctance from some people [in the marijuana industry] to trust the media because there have been so many years of bad coverage and jokes. And it’s not really something to laugh about. It’s a real industry. Do you think it’ll be difficult for Marijuana.com to be taken seriously as a journalism brand? I hope not, and I don’t think that it will. What I really want to do is raise the bar on the quality of our content. My approach is to go where the story takes me, go where the science takes me and go where the data takes me. Marijuana.com isn’t just a publishing company; it’s also a data and technology company, and we’re going to tap into that to tell interesting stories. I want to be the Wine Spectator of marijuana, the Rolling Stone of marijuana, the ESPN of marijuana. I want to attract everyone from the connoisseur to the curious. We’ll be covering news, but we’ll also educate and inform. So if you’re a longtime smoker, this is the place for you. If you’re a baby boomer who fell out of using marijuana and you have questions about the new technology, we want to appeal to you as well. How important was it that The New York Times editorial board endorsed marijuana legalization? I thought it was huge. It tells you where we are as a country to have the Gray Lady say that this should be taken out of the black market and the gray market and let’s figure out a smart way to regulate this. It woke a lot of people up. How do you see coverage of this story evolving as legalization becomes more widely accepted? The story is not just going to all of a sudden end when it’s legal. I compare it to alcohol prohibition ending in 1933. It remained a story for another 50 years. When they ended prohibition, in most states, they still didn’t allow bars. They didn’t allow home brewing until Jimmy Carter was president. There are so many things happening in the marijuana industry that are going to take a lot of time and a lot of legislation.